The Minister of Human Resource Development (MHRD) will constitute a committee to look into the working of research parks established at the Indian Institutes of Technology (IITs). "We've provided funds for several IITs to set up such research parks. 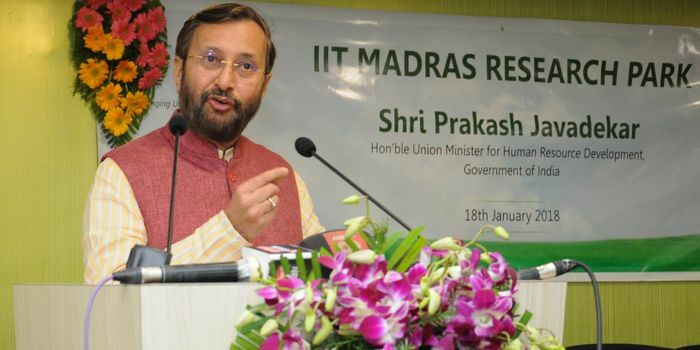 We'll set up a committee to ensure the efforts of IIT Madras is replicated everywhere else," he said. "Industry-Academia collaboration has been talked about a lot but here it is being done effectively. There are startup companies, innovators and corporates in an ecosystem of innovation. They're enthused by the innovation of others in this ecosystem," Javadekar said. Home to India’s first university-driven research park, the research park at IIT Madras is modeled along the lines of successful research parks found in top institutes like Stanford, MIT and Harvard. Javadekar said that Incubation Cells, like the one at IIT Madras, are the real key to 'Make in India.' Encouraged by the success of the IIT Madras experiment, many Indian companies and universities are now starting to fund research in India rather than funding research abroad. The Minister also lauded the facilities at the IIT Madras Research Park, which was completely eco-friendly. The research park at IIT Madras seeks to catalyze collaborative research between industry and academia and enable technological innovation and nurture entrepreneurship. It houses the R&D and innovation wings of industry majors engaged in collaborative research and technology transfer with the faculty. Prof. Ashok Jhunjhunwala, Faculty-in-charge of IITMRP, and Principal Advisor, Ministry of Railways, Government of India, gave a presentation on the research park and its achievements since its inception. He also outline its future plans. “An important component of the eco-system to make India a nation which designs, develops, owns, manufactures and commercializes products, will be undertaken at the university-associated Research Parks (RPs). These research parks could take the industry-academia interaction to a new height,” he added. If I get AIR 10 what is the fee for me in IIT Madras? How to get admission on iit madras in aerospace engineering? Which should I chose Nit Trichy core branch or IIT Madras lower branches? I got 380 out of 600 in 12 board exam it's eligible for the admissions. At IIT Madras...? Your IIT Madras brochure has been successfully mailed to your registered email id .